We have gotten fairly comfortable with the sort of acting that we see on television and in movies. On top of that, we have internalized the idea that we should be able to see whatever we want whenever we want. I can compare the original television series One Day at a Time to the Netflix reboot next month over breakfast. If I wish, I can compare the acting capabilities of each cast while devouring my allotment of Pop Tarts. If I so desire, I can also see how I feel about the various attempts at portraying Hamlet: Derek Jacobi vs. David Tennant? Kevin Kline vs. Kenneth Branagh? Of course, they are all products of late 20th schools of acting. We expect their efforts to feel realistic. Shakespeare never really waned in popularity, but we don’t have the luxury of viewing 19th century productions (or earlier), though we can rest assured that they were pretty different: diction and voice mattered a great deal; emotional expression mattered, but was conveyed through the text and the delivery. Word is that acting was less physical, but I find it somewhat difficult to imagine the final sword fight if the cast stands still. Anyhow, we do constantly update our art. Theatrical productions are the most obvious case, but painters do go back and look at the same things again. It does beg the question of why we feel compelled to revisit something that has already been done to bits. Something about it still speaks to… who? Generally, another artist- that’s the real answer. We decry when it speaks only to their bank account, like another summer movie sequel, but we praise the artist that can bring a fresh eye to a classic. I have mentioned my troubled relationship with opera before. I knew the music was good, but the stagings were tedious. Unaccepting of the unfamiliar as a youth, I complained when I saw a Shakespeare play transferred to the Old West, because it was not authentic. A few years later, I was enjoying any ridiculous interpretation as long as they kept things moving. The opera world was no different, but I had far less expectation that anything would be done a particular way. I just wanted something that could talk to me without requiring dubbing or a week’s study beforehand. Enter Peter Sellars with his production of Mozart and da Ponte’s Così fan tutte. Look, I know this might not be everybody’s cup of tea, but it connected with me. And it is a different interpretation than had previously been available to me. 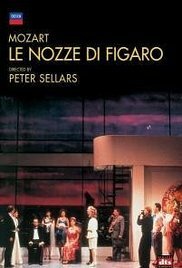 I connected with the presentation of the story in a way that I had not been able to before because Sellars brought his artistry to the creation of Mozart and da Ponte. I have hesitated to say that this was my way in to opera. Truly, it was a bit of a slog finding productions done by others that held my interest as well. I watched whatever else Sellars did, but that wasn’t so much the same thing. You’ve Got to Check This Out is a blog series about music, words, and all sorts of artistic matters. It started with an explanation. 93 more to go.